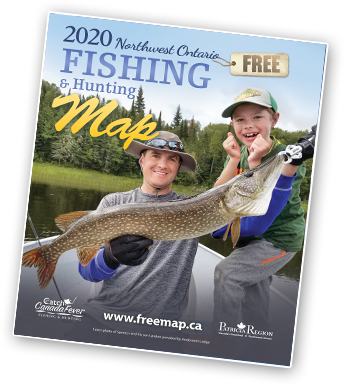 Get Your Free Map Now! Please note that this is a general overview of the regulations - you MUST check for any exceptions in the Fishing Regulations. For a full report of the regulations, download the latest publications from the MNR. Ontario fishing in Canada's Heartland is such a prized destination because of our thousands of lakes- all of which boast good to excellent fishing. Most have a wide variety of fish types including walleye, northern pike, muskie, smallmouth bass, lake trout, perch & whitefish, with many trophy lakes. The fishing has been kept consistently great due to conservation efforts, so that you and your kids can experience the type of exciting fishing vacation that they had in the good old days. Northwestern Ontario common species of fish you'll find in lakes in Canada's Heartland include Walleye, Northern Pike, Muskellunge, Smallmouth Bass, Lake Trout, Whitefish, Perch, Brook Trout & Sauger. Not all species are found in all lakes. Non-Canadian residents need an Outdoors Card to fish in Ontario if they are 18 years of age and over (NOTE: Non-residents 65 years of age or older are not exempt from requiring a licence). The sportfishing licence tag (1 one year or 8 day) or the conservation fishing licence tag (1 year or 8 day) accompanies the plastic Outdoors Card. Like most places you will need a fishing license to legally fish in Ontario. Licenses (both fishing and hunting are readily available throughout the area usually through bait and tackle stores or most of the Region's outfitters. Licenses come in several flavors but generally are either a Sportfishing licence (full limit) or a conservation Licence (reduced limit). Many lodges and outfitters now include a conservation licence as part of their packages. Just ask! There are also some Fishing Tips and Articles on this site to help you get started on planning your fishing trip to Canada. Click here for a list of Fishing Articles. When making a fishing trip to North Western Ontario (Canada's Heartland), you should always make reservations in advance to ensure that you have a place to stay. Most fishing lodges and outposts book up well in advance of the season. We suggest you book your accommodations as soon as you have your trip dates setup. American Plan Fishing Lodges and Resorts can usually supply ( on request) most everything you need for your trip and basic plans include most or all of your meals. If you want to get the cost down a bit you could consider a Housekeeping Plan Lodge or Camp where you can do your own cooking and cleaning. This will help make the trip more affordable. Another option is to go on an Outpost Adventure where the Outfitter flies or boats you in and sets you up at a wilderness cabin (often the only one on the lake) for a real total wilderness experience. Click here to find the one best lodge/ Outpost for you and your family. "Make sure you know the fishing regulations" says the Ontario Ministry of Natural Resources (MNR). They release updates of the fishing regulations each year. You can either pick up a hard copy of the fishing regulations by stopping at many of the local Bait and Tackle Stores or the local MNR office. Or for online details on Ontario Fishing Regulations, Click here. CanadaFever.com is a Canadian Fishing & Hunting specialized chat forum (featuring fishing reports for the Canada's Heartland area). Here fishermen and hunters are able to exchange experiences and share insights with each other as well as read what the latest fishing has been like in the Patricia Region. Click here to visit the fishing forums on CanadaFever.com. For information on where to purchase fishing equipment, tackle, and gear locally - see our listing of Allied Members in the Northwest Ontario Region. Or simply do a search by business sector. Minnows, night crawlers or leeches. Rods, Reels, Line: Medium to Medium Heavy 6' - 7' graphite rods (medium heavy when using monofilament lines and medium action when using spectra and kevlar type lines), bait casting reels to match rod weight and balance, 10-15 lb. test line. Clouser Minnow, Lefty's Deceivers, Sizes 3/0 to 2. Bucktails, Spoons, Jigs and Bass spinner Baits. Medium Heavy to heavy 6' - 7' rods with roller tip when using wire line Penn 209 or Daiwa line counter reels or similar type and cap. Spectra and devlar equipped rod and reels could be used with 280-300 yds. line cap. 14 pound test line is recommended. Sutton spoons # 1 choice. (Gold & silver works best.). Big Rapalas, Shad Raps, Rat-L-traps, Red eyes, Doctor Spoons, Northport Nailers, Flutter spoons and 2 oz. jigs for dead bait rigs. For late summer fishing you can use a 3-way swivel and snap swivel to handle 2-8 oz weights. Dipsey Divers also work well to keep your lure running deep. In spring, use in line planers such as Yellow Birds to spread your surface runner baits. Leeches are the # 1 choice or night crawlers work well also. Fly Rod - 6-7 wt. Fly Reel - 5-7 wt. Fly Line - 6-7 wt. Flies - Crayfish, Muddler Minnow, Marabou Leech, Woolly bugger, Dahlberg Diver, Sizes 2-6. (C)2013 Patricia Regional Tourist Council. All Rights Reserved.